When activists gathered on the steps of San Francisco’s City Hall to mourn and protest violence against transgender women of color on Tuesday, they had a list of four trans women of color who have been murdered since the beginning of the year. An hour into the protest, activist Isa Noyola took to the microphone to announce a fifth: Penny Proud, a 21-year-old black trans woman, had been shot and killed the night before, in New Orleans. The others victims were Ty Underwood, a 24-year-old black trans woman and nursing student, who was shot and killed on January 26 in North Tyler, Texas; Lamia Beard, a 30-year-old black trans woman, who was shot and killed on January 17 in Norfolk, Va.; Yazmin Vash Payne, a 33-year-old black trans woman, who was stabbed to death on January 31 in Los Angeles, Calif.; and Taja DeJesus, a trans woman of color who was stabbed to death on February 1 in San Francisco. The rally at City Hall had been organized in response to the death of De Jesus. Her friends and family called for supporters to show up for what they called a “Trans Liberation Tuesday” in Taja’s honor, under the hashtags #TurnUp4Taja and #TurnUp4TransPeople. DeJesus, 36, was active in the Bay Area trans community, and local activists are currently fundraising for her memorial service on Indiegogo. Her death has prompted the formation of an organization called the TAJA (Trans Activists for Justice and Accountability) Coalition, whose official demands include the end of violence against trans people by cisgender people; an end to a plan to build a new jail in San Francisco, with funds rerouted to trans community programs; and safe affordable housing for trans people. While white and cisgender protesters looked on, several dozen trans women of color held a “die-in” for three minutes and 50 seconds, a time chosen to symbolize 35 years. Thirty-five years is the average lifespan of a trans woman of color, a frequently cited statistic that Rochelle referenced when she spoke at the rally last Tuesday. “Remember my face,” she told the crowd of several hundred, “because the statistics will tell you that in the next decade, I will have died violently.” As the women lay on the ground feigning death, Breanna Sinclaire, a black trans opera singer, sang Amazing Grace. Thanks to the popularity of Amazon’s breakout series Transparent, writer and activist Janet Mock, and Orange Is the New Black’s Laverne Cox, who was recently cast as the first series regular trans character on a primetime network show, transgender people are more visible than ever in the United States. Over the past year, we’ve seen trans women grace the cover of Time magazine and take Piers Morgan to task on CNN. In January, President Obama became the first U.S. president to recognize transgender people in a State of the Union address. The proliferation of online activist communities pushing for inclusion and respect is also linked to the increased visibility of transgender people. Viral hashtag campaigns like #girlslikeus, which Mock created in 2012, and #RealLiveTransAdult, which was created following the suicide of transgender teen Leelah Alcorn, have helped the activist community mobilize and have greatly contributed to heightened awareness of transgender rights. But while the media and political leaders slowly acknowledge the existence of trans people, trans people continue to face an epidemic of violence that disproportionately affects trans women of color. According to the National Coalition of Anti-Violence Programs’ most recent Hate Violence Report, 72 percent of victims of LGBT hate homicides in 2013 were transgender women, and 67 percent were transgender women of color. The report also found that, of all LGBTQ survivors of hate attacks, trans women were six times more likely to experience physical violence from police than others. For many, San Francisco is seen as an oasis of tolerance and community support for transgender and gender non-conforming people. But the city’s trans community has been shaken by violence following the murder of De Jesus and a stabbing attack against two transgender women riding the bus on January 5. The LGBT Center’s study is based on interviews with more than 400 members of San Francisco’s LGBT community. It found that high proportions of respondents had experienced sexual violence (48 percent), physical violence (68 percent), and harassment (81 percent). In each case, transgender respondents were significantly more likely to experience violence than cisgender respondents. The increased danger, discrimination, and harassment faced by trans women of color was of particular concern to the protesters and speakers on Tuesday, who emphasized the distinction between sexuality and gender identity—and the distance between San Francisco’s cisgender gay community and their own experiences. 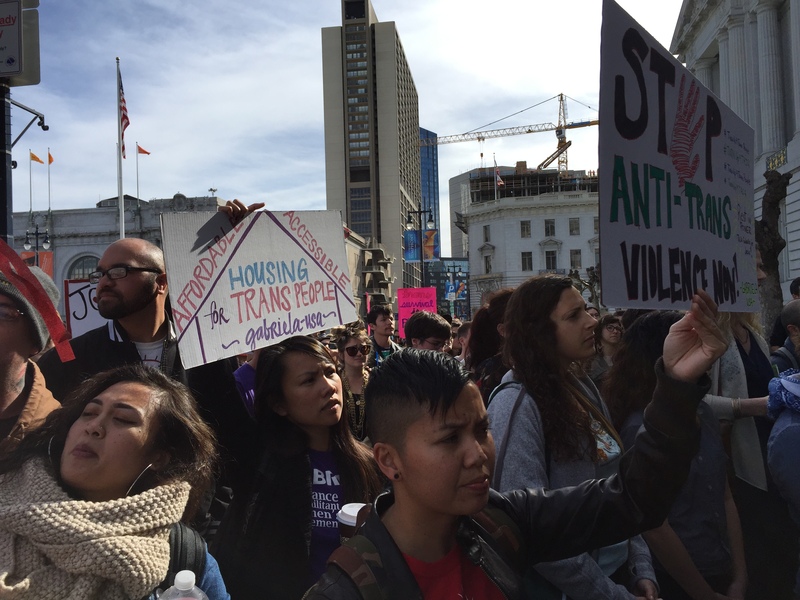 Among the concerns for the trans women speaking out on Tuesday was the tech boom–fueled gentrification and displacement which has remade San Francisco in recent years, pushing poor communities of color out of the city. One day after the San Francisco Chronicle suggested that 2014’s tech-industry backlash had fizzled out, the city’s cozy relationship with the tech industry was back in the crosshairs. Shimmers has documented her life on YouTube and creates videos about trans issues. Her most recent video is a vlog post about the recent murders, which she posted with the hashtag #TransLivesMatter. She encourages other trans people to share their experiences online. “Sharing something with the world may save your life,” she said.